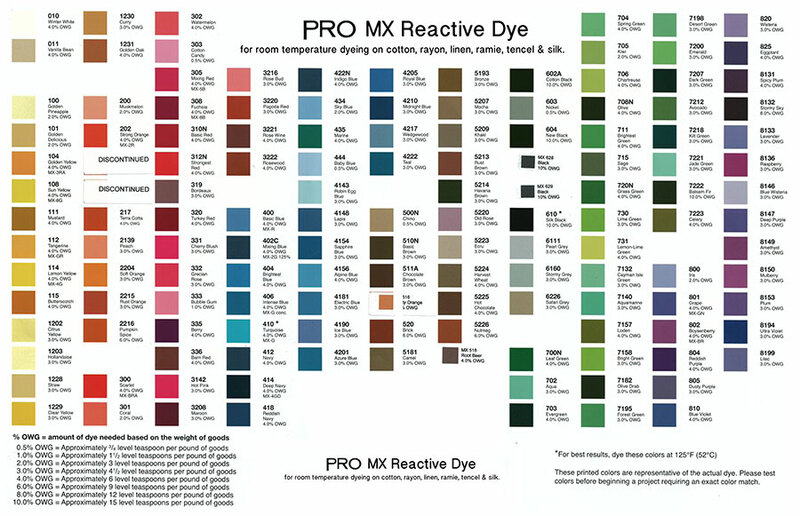 PRO MX Reactive Dyes (Procion) are designed to permanently dye cellulose fibers -- plant based fibers like cotton, linen, ramie, hemp, viscose rayon, bamboo, jute, paper, wood, basket reed, even silk at room temperature, 75° - 95° F (24°C to 35°C). They also dye protein fibers like wool, using acid at a boil or with steam. This is the most reactive of all types of dyes and most versatile with excellent wash and light fastness properties. Available in over 135 colors ranging from delicate pastels to vibrant tones, and are completely intermixable. Two ounces (58 gm) will dye approximately 3 pounds or 14 yards (13 meters) of cotton muslin to a medium shade in a solid shade dye bath, or 12 T-Shirts for tie dye and can be kept in solution (without fixative) for four to five days at room temperature.